We have 28 clipping service obituaries (from Baltimore, Boston, Chicago, New York, Newark, Philadelphia, Providence, Springfield (Massachusetts) and Washington D.C.) from Henry Romeike, Inc., 33 Union Square, Broadway. At least two of the obituaries use the phrase "old school" actress. But clearly EJP had a distinguished career, probably more distinguished than John Nickinson's. Perhaps as theater historian GCD Odell observed (comparing EJP to actress Marie Wilkins) the competent, conscientious Mrs. Phillips lacked something of the required touches of broad comedy". But she certainly came into her own as a mature character actress, and has given me (and others) insight into and perspective on her times -- and my own. Mrs. Elizabeth J. Phillips, who for a period of nearly a half century was among the most admired of players on the American stage, died at the home of her daughter, Mrs. John Dolman, in Philadelphia on Aug. 3. She was seventy-four years of age and had long suffered from paralysis. Four years ago she was first attacked by that malady, and after a second attack two years ago, her strength gradually declined, until at length she became almost completely helpless. The news of her passing brings deep sorrow to the theatrical world, and especially to the older players, with whom she was associated in her active years. Besides her dramatic abilities, which made her public career one of prolonged success and great honor, Mrs. Phillips was possessed of unusual personal qualities that won for her the admiration and devotion of a very large circle of friends. In her home life she revealed those traits of character that have ever ennobled the words "wife and mother". She was of domestic temperament and her home was an ideal place to those who dwelt there, and to the many who entered there as guests. Her gracious manner, her splendid womanliness and her fine dignity earned for her the title of "Lady" Phillips, and by that title of respect she was known in the theatre as well as in the home circle. A.M. Palmer, under whose management she played for twenty years said, in speaking of her, after her death, that "she was accomplished, faithful, full of old-fashioned notions of the dignity of her calling, and thoroughly conscientious in fulfilling her duties to the public and the management"
Those with whom Mrs. Phillips was more particularly associated were JH Stoddart, Rose Eytinge, Fanny Morant, Clara Morris, Stuart Robson, Maud Harrison, Agnes Booth, Sara Jewett, Annie Russell, Virginia Harned, Charles Thorne, Ida Vernon. Herbert Kelcey, Frederick Robinson, Thomas Whiffen, EM Holland and Kate Claxton." The Chicago Record and Herald (Aug. 12, 1904) quoted Palmer's tribute and James O'Donnell Bennet added "There is a whole lecture for the modern, irresponsible, showy and pert school of actors in those few lines"
Mrs. Phillips was born in Chatham, Canada, on Sept. 7, 1830. Her family was in no way concerned with the theatre, and she passed her girlhood in an environment that would seem to offer small opportunity for the development of dramatic talent. She made her first appearance on the stage at Hamilton, Canada on Easter Monday 1852 in the role of Grace Harkaway in London Assurance and won immediate favor with the public. Her advancement during her early years on the stage was rapid, and after a short period of service in minor roles she became the leading woman of the Pike company in Cincinnati. There she played a wide range of parts in the Shakespearean and standard drama, and appeared in support of Edwin Forrest, Charlotte Cushman, and nearly every other prominent star of the time. In 1871 she began a three years' engagement with Lawrence Barrett, playing leading roles in the standard repertoire and at the conclusion of that term  she joined F. F. Mackay's stock company at the Chestnut Street Theatre, Philadelphia. There she remained until, in 1877 she became a member of Mr. Palmer's company at the Union Square.... Among the plays in which Mrs. Phillips made particular successes were The Lights of London, Saints and Sinners, A False Friend, Our Society, The Two Orphans, Jim the Penman and Sealed Instructions. Her Lady Ogden, in A False Friend was a masterly performance. In that role she simulated the sufferings of one stricken with paralysis, the malady to which she herself succumbed, and she was described by a line in the play as "a sort of woman one might expect to fight disease and death." Such a woman was Mrs. Phillips herself, for at the age of sixty she was as full of animation as a girl and as strong hearted and courageous. 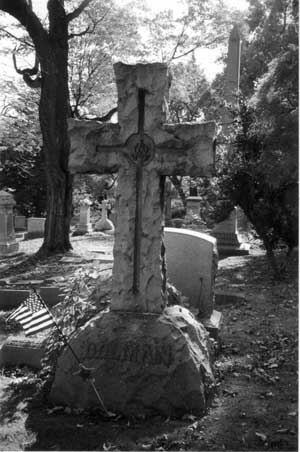 Mrs. Phillips is survived by her daughter, Mrs. Dolman, the wife of a prominent attorney in Philadelphia, and by three grand-children ....The funeral services were held in Philadelphia on Saturday, Aug 6, and the burial was made in West Laurel Hill Cemetery [Philadelphia]. The pall bearers were Mrs. Phillips' son-in-law, Mr. Dolman, and her grandsons. The floral tributes were many and beautiful. The New York Times obituary (August 10, 1904) was less effusive. The headline read OLD ACTRESS DEAD but does not mention John or Albert Nickinson (or grandchildren) or the Madison Square theatre company. "Mrs. EJ Phillips, one of the oldest  actresses in this country, is dead in Philadelphia. ...In her forty-five years of stage life she was associated with nearly every prominent actor and actress of her time. Mrs. Phillips was a Canadian, where she was born in 1830. ... During her three years with Lawrence Barrett she played nearly all the important Shakespearean roles. A dozen years ago Mrs. Phillips held a position on the American stage very similar to the one Mrs. Gilbert holds to-day. She had all the grande dame roles in Mr. Palmer's and afterward in Charles Frohman's stock companies. Like many other stage favorites her "last appearance" was predicted many years before it actually occurred. Toward the end of her career every time she came on the stage she was greeted with a storm of applause, just as Mrs. Gilbert was greeted at the Garrick last fall. A New York Dramatic News obituary (Aug. 20, 1904) noted that EJP made her home with her daughter, Mrs. John Dolman, in Philadelphia, and whenever W.J. Ferguson, Annie Russell, John Drew and Mrs. Gilbert visited that city they were sure to call at 3219 Clifford avenue and spend a few hours chatting to brighten the declining days of this admirable actress." The New York Sun obituary, headlined "Veteran actress dead", started with "Mrs. Elizabeth J. Phillips, who was known among theatrical people all over the country as "the grand old woman of A.M. Palmers Union Square and Madison Square companies" and calling her "one of the most versatile of actresses, but was most successful in character parts." The North American (Philadelphia) obituary noted that EJ Phillips "boasted at the age of 60 that she could dance as well as a girl of 20". The New York Clipper obituary (20 August 1904 "Deaths in the profession") called her "the distinguished old actress ... known as "the grand old woman of A.M. Palmer's Union Square and Madison Square companies ... her active stage career, which extended over a period of forty-five years. She was at different times identified with most of the leading stock companies of New York. ... Her first appearance as a leading woman was with Pike's company, in Cincinnati, in 1865 [after John Nickinson's death]. .. A list of the actors and actresses with whom she appeared would embrace practically all the well known players of her time. We have 28 clipping service obituaries (from Baltimore, Boston, Chicago, New York, Newark, Philadelphia, Providence, Springfield (Massachusetts) and Washington D.C.) from Henry Romeike, Inc., 33 Union Square, Broadway. Did these come to John Dolman in his role as Philadelphia correspondent for the New York Clipper? The cuttings' slips are headed with "O wad some power the giftie gi'e us To see our sel's as ithers see us." and Romeike's is identified as "The First Established and Most Complete Newspaper Cutting Bureau in the World." At least two of the obituaries use the phrase "old school" actress. But clearly EJP had a distinguished career, probably more distinguished than John Nickinson's. Perhaps as theater historian GCD Odell observed (comparing EJP to actress Marie Wilkins) the competent, conscientious Mrs. Phillips lacked something of the required touches of broad comedy". But she certainly came into her own as a mature character actress, and has given me (and others) insight into and perspective on her times -- and my own. Cousins Susan and Peggy Spencer went to West Laurel Hill Cemetery in October 1998 to search for EJ's grave. "A gorgeous and huge cemetery -- we didn't find it that day but Susan went back the next day and spoke to Lucille Costello who looked up the records and escorted her to the Dolman family plot. EJ's grave is not marked separately. The plot is about 16 feet square. At the foot there is a stone they call a "sill" I guess you can stand on it. You are then facing a very large cross -- about 8 feet high -- at the far end of the lot. It just says "Dolman " across the bottom, rough hewn and mighty looking. No other names or dates. The only marker on the ground is one for James Dolman in the upper left hand corner, who died in 1891. The cemetery records show that Elizabeth J. Nickinson is in that plot (no mention of Phillips) as well as John and Hattie, Mary Ann, Charles, Elizabeth (John and Hattie's daughter who died in 1892), Amelia, John Dolman Sr. (1895), Edward, Ellen and Josephine [Josie].